Today’s chatbots, for the most part, aren’t all that useful, but what if you could use them to learn a new language? When it comes to learning languages, using what you’ve learned in the context of a conversation is extremely useful. If you are learning online, though, you often don’t have anybody to talk to. That’s why Duolingo today introduced chatbots to its app that allow you to have AI-powered conversations. 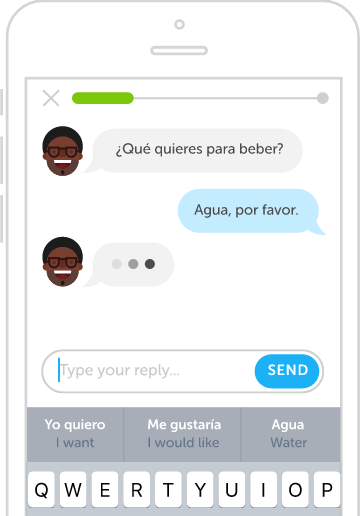 These Duolingo Bots currently work for users who want to learn French, Spanish and German. The company promises it’ll add other languages soon. Sadly, this feature also currently only works in the Duolingo iPhone app. Given that the bots’ intelligence resides in the cloud, you’ll have to be connected to the Internet to use this feature. To make talking to the bots a bit more compelling, the company tried to give its different bots a bit of personality. There’s Chef Robert, Renée the Driver and Officer Ada, for example. They will react differently to your answers (and correct you as necessary), but for the most part, the idea here is to mimic a real conversation. These bots also allow for a degree of flexibility in your answers that most language-learning software simply isn’t designed for. There are plenty of ways to greet somebody, for example, but most services will often only accept a single answer. When you’re totally stumped for words, though, Duolingo offers a “help my reply” button with a few suggested answers. For now, you can only use text chat to talk to the bots. Over time, Duolingo plans to allow for spoken conversations as well, though.